The objective of this lab is to design a 10th order band pass filter using a 5th order low pass filter as a base. The filter will be designed using a normalized Chebyshev template then a table will be used to convert the system form a low pass filter to a band pass filter. 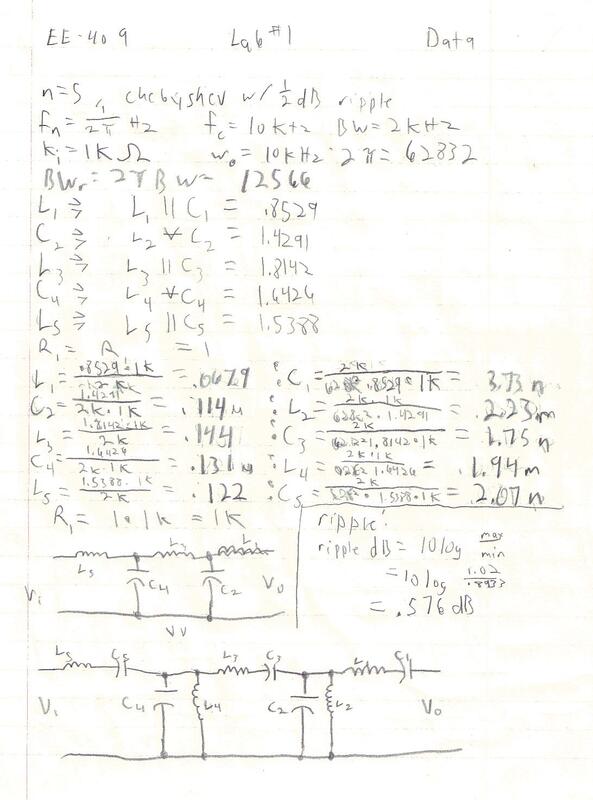 1)	Using a Chebyshev filter as a prototype, design a 10th order band pass filter with a center frequency of 10KHz and a bandwidth of 2KHz and Zo of 1KW. This lab has demonstrated that a 10th order band pass filter can be designed from a 5th order design. Here we used the Chebyshev filter as a template, however, any filter bas can be used if the proper transforms and scaling factors are applied. The primary difficulty with this lab was realizing that the scaling factors were in radians/second. Therefore, I had to apply an additional 2p scaling factor. After several attempts, I got the circuit functioning properly. The inconsistencies in the bandwidth are most likely a result from inaccuracy of the markers. The inconsistency in the ripple, which should be <.5dB is because the simulation reported a gain at certain frequencies which is not directly possible. 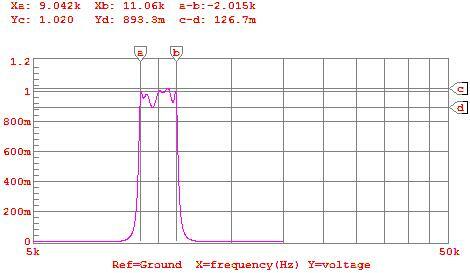 Using 1 instead of the reported maximum yields a .490dB ripple in the passband. Overall, I believe that this lab was successful.